Following raised hopes and expectations for the future of the political process and the restoration of the institutions of the Good Friday Agreement, with the conclusion of talks at St Andrews in Scotland last week, confusion and disappointment were the order of the day as DUP leader Ian Paisley refused to attend a Programme for Government Committee at Sormont on Tuesday. The meeting would have seen Paisley and other DUP leadership figures dealing directly with a Sinn Féin delegation led by Party President Gerry Adams. Commenting on the latest turn of events, Gerry Adams said that a lot of people would be disappointed by the refusal of DUP leader Ian Paisley to attend the Programme for Government Committee. "There was a lot of hope among people that today would see the political parties stepping into a new phase of this process', said Adams. He continued: "Mr. Paisley has accused the British government of bad faith. He has not accused Sinn Féin of bad faith. He obviously has the political resolution to that problem in his own hands. He should talk directly to Sinn Féin on these matters. "Sinn Féin has put forward suggestions about the pledge of office which would, in our opinion strengthen it. If Mr. Paisley has other suggestions then he should come along and talk to us and resolve these issues. I hope he does so speedily. "There was a problem today. We didn't create the problem. Mr. Paisley has to resolve the problem he has highlighted and I wish him well in doing that. Within the terms of the Good Friday Agreement and our rights and our entitlements, and the future for all of the people who live on this island, then Sinn Féin will be helpful." Pailsey's refusal to attend the meeting at Stormont followed media comments by DUP MEP Jim Allister who expressed scepticism about the St Andrews proposals. Views expressed by noted rejectionist hardliner Allister mirrored the views of maverick unionist politician Bob McCartney rejects the whole idea of power sharing and the Good Friday Agreement. The latest developments followed intensive political talks involving the Irish and British Governments and all the parties in the Six Counties at St Andrews in Scotland. Emerging from three days of talks on Friday 13 october, at a joint press conference with Taoiseach Bertie Ahern, the British Prime Minister Tony Blair said the agreement reached between them would help secure a "shared future". Blair believed the negotiations between the British and Irish governments and the parties had delivered "a way forward". "Of course everyone has had to make compromises but nonetheless I think it is a proper and sound basis. It gives us a chance to have institutions that are up and running, that are secure on a cross community basis where all parties are in government working together for a shared future," said Blair. Bertie Ahern said all the elements were now in place to "bring satisfaction to all issues". "It's not perfect but it's a fair and sustainable balance to try by March to make sure we have a working executive based on power sharing and an acceptance of policing and the rule of law," said Ahern. 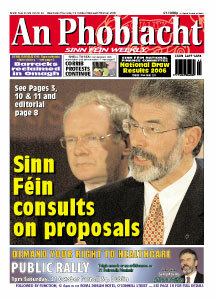 Sinn Féin President Gerry Adams urged republicans to study the St Andrews' documents and debate the issues. "They need to make their views known and be part of the effort to resolve these matters," said Adams. "There's a lot of talk about delivery. Republicans have delivered big time in recent times. We have a moral responsibility to keep delivering but it's a collective responsibility," said Adams. "Unionists can have confidence that their interests are being advanced and democracy is finally winning the day," declared the DUP leader Ian Paisley as he emerged from the talks. "The days of gunmen in government are hopefully over forever. There must be unequivocal support for the laws of the land and those who enforce them", he said. Speaking at a republican rally in the Markets area of Belfast last Sunday, Sinn Féin President Gerry Adams warned that the DUP would try to portray the outcome of the political talks in Scotland as a series of unionist victories while cautioning republicans to be more mature in their assessment of the proposals made by the Irish and British Governments in St Andrews the previous day. Addressing the 30th Anniversary commemoration for IRA Volunteers Joey Surgeoner, Paul Marlowe and Francie Fitzsimmons, killed in an explosion at the gasworks in October 1976, Adams said that St Andrews was about "moving the anti-Agreement DUP to a position where they are prepared, for the first time ever, to accept power sharing with Irish republicans and to participate in all-Ireland political arrangements. That is a big challenge for them and for us. Bringing rejectionist unionism into the peace process would be an enormous achievement," said Adams. Sinn Féin's Dáil Leader Caoimhghín Ó Caoláin TD told the Dáil on Wednesday, during statements on the St Andrew's proposals that the talks last week have put in place the basis for further progress but said there was 'no substitute to direct dialogue between the DUP and Sinn Féin'. Pointing to a range of issues it was necessary for the British and Irish governments to deliver, Deputy Ó Caoláin restated Sinn Féin's position on policing, before concluding by expressing the opinion that he did not believe the proposals necessitated endorsement either through an all-island referendum or an election in the Six Counties. The Sinn Féin Ard Chomhairle meets in Dublin today (Thursday). At the meeting Gerry Adams will brief the party leadership on the talks which took place at St. Andrews. The Ard Chomhairle will also decide on the consultation which will take place in the party in the coming weeks. Meanwhile Sinn Féin's campaign against Direct Rule, 'Can you afford it? ', continued this week with activists engaging in a Six County-wide initiative. Launched by Gerry Adams prior to the St Andrews meeting with a rally of activists at Belfast's Europa Hotel the campaign has continued with local meetings held across the Six counties and mass leafleting. The campaign is urging ordinary people to "speak up" and challenge the imposition of a range of detrimental policy decisions taken by British Ministers, from rates increases, health and education cuts to water charges. The campaign is demanding the return of the Assembly, Executive and All Ireland institutions. "This campaign is about reaching out and engaging with all sections of our society and encouraging them to get involved in the campaign," said Sinn Féin Assembly group leader John O"Dowd. Over 50,000 leaflets have already been delivered across the Six counties, including many traditionally unionist areas such as Ballymena and Portadown. 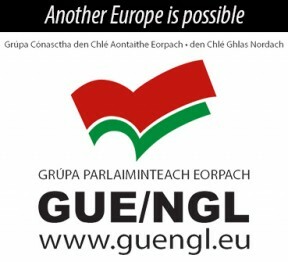 The campaign will cross the border next week with leaflet drops in border counties, Cavan and Monaghan and Donegal. "The campaign will be going out onto the streets over the next couple of weeks and we are asking people to mobilise their friends and neighbours, to contact the media and to lobby their local politicians and civic leaders," said O Dowd. "No one is saying that power sharing will be a panacea for all our problems but we strongly believe that a locally elected and accountable Assembly and Executive will do a much better job than part-time unaccountable ministers," saidODowd.